Are you looking for Best Performing Tax Saving Mutual Funds for Investment? As the financial year, 2018-19 is about to end, you must have started tax saving and tax planning exercise of 2019. ELSS – Tax saving mutual funds play a vital role during tax planning exercise. ELSS (Equity Linked Saving Scheme) is one of the best ways to save tax and generate wealth. ELSS offers tax benefits under section 80 C of the Income Tax Act. ELSS comes with a lock-in period of 3 years. However, ELSS offers multiple benefits to the investor. Key features and benefits offered by ELSS are given below. ELSS is equity linked saving scheme. ELSS is a type of mutual fund that invests the major corpus in the equity market. ELSS comes with both dividend and growth options. ELSS funds come with Lock-in period of 3 years from the date of purchase. Long-term capital gain tax is applicable to ELSS. Investment in ELSS can be started with a minimum amount of Rs.500. ELSS is dual purpose investment. You can save tax as well as generate wealth by making the investment in ELSS. An investor can claim a tax deduction up to 1.5 Lakh by making the investment in ELSS. The lock-in period of ELSS is lowest compared to all other tax saving options such as tax saving FD or PPF. ELSS provides higher returns compared to other tax saving instruments. ELSS fund offers SIP investment option, which brings discipline in regular investing. ELSS has no fixed maturity date or period. You can continue to hold ELSS as long as you can. ELSS is the best tax saving instrument in terms of expected return, lock-in period and periodicity of investment. ELSS invests money in the equity market and equity market is a risky investment option. ELSS comes with Lock-in period of 3 years. This means you don’t have flexibility in terms of liquidity. You need to pay long-term capital gain tax on redeem amount. The return offered by ELSS is variable. ELSS may end up giving negative returns if the market is not performing well. After looking at the key features and benefits of ELSS. 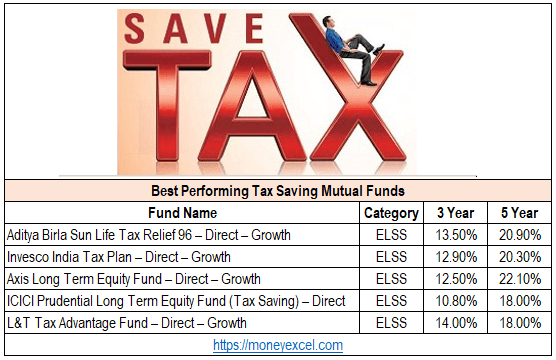 Let’s look at Best performing tax saving mutual fund ELSS. The first best-performing tax saving mutual fund is Aditya Birla Sun Life Tax Relief 96 – Direct – Growth Fund. The objective of this fund is to invest 80% of the assets in equity and remaining in debt and money market instruments. Aditya Birla Sun Life Tax Relief 96 – Direct fund has given very good returns to the investors. In last 3 years, this fund has given 13.5% returns to the investor. If we look at the 5-year horizon this fund has given 20.90% returns. It is open-ended fund managed by an experienced fund manager. It is 3 star rated fund, investing money in mid-cap as well as large cap. The second best-performing tax saving mutual fund is Invesco India Tax Plan – Direct – Growth Fund. This fund intends to invest across market capitalization sectors utilizing bottom up approach. In last 3 years this fund has given 12.90% return and in 5 years fund has generated 20.30% returns. This fund is performing well in both bull as well as bear market. It is slightly conservative tax saver fund. Next best performer in the list is Axis Long Term Equity Fund – Direct – Growth Fund. This scheme aims to generate long term capital growth by investing in companies with strong fundamentals. This fund has generated magnificent returns of 22.1% return in last 5 years. It is four star rated fund with low expense ratio. It is very good mutual fund under ELSS for investment. ICICI Prudential Long Term Equity Fund (Tax Saving) – Direct is one of the best performing tax saving mutual funds. It is four star rated fund. This fund invests 90% of the money in the equity instruments and 10% in debt and money market instruments. The fund is managed by experience fund manager. ICICI Prudential Long Term equity fund has given 18% return in last 5 years. L&T Tax Advantage Fund – Direct – Growth is next in the list of best-performing tax saving fund. This fund primarily invests in equity and equity-related securities. It is four star rated fund with low expense ratio. This fund has generated 18% returns for the investors in last 5 years. Note – I have considered 5 years as long-term investment. The definition of long term may vary from person to person. I have selected direct funds as it is likely to give better returns. Always prefers SIP mode of investment over lump sum. This is to get advantage of cost averaging. It is advisable to go for growth option over dividend for wealth generation. You should prefer direct plan to save cost and generate higher returns. It is good idea to remain invested in ELSS beyond lock-in period of 3 years. In addition to ELSS, one should also invest money in equity mutual funds. Maximum advisable ELSS in your portfolio are 2 or 3. Do you invest in ELSS Mutual funds for tax saving? Do you Best performing ELSS tax saving mutual funds will give similar performance in the future? Subscribe to our blog and get the latest updates in your inbox.